Are you shopping for an adjustable lift chair table to go with your lift chair? Here are lift chair table reviews about the top 3 lift chair side tables. We dissect each one and give you an honest recommendation. Very functional, can be used as support, versatile. Make sure you have a 3″ clearance. Click here to read reviews. Shown above, this is the right side model of the Drive Medical Seat Lift Chair Table. Available in left or right models, the Seat Lift Chair Table is table that can swivel 180 degrees. This allows the sitter to walk out from his/her lift chair without having the table in the way. The table requires the front and back feet of the lift chair to be placed on the metal base. The weight of the lift chair holds the table in place. An average lift chair weighs 100 pounds, which is more than enough to hold the table steadily. The lift chair table can be raised, lowered, pushed back, pulled forward, and tilted. This lift chair table features a built in magazine rack. Make sure you pick the right model (left or right) so that you are able to use the magazine rack. Users found that a little WD-40 helps make the table operate smoothly. It is ill advised to use the table as support when getting up. This lift chair table can be purchased on Amazon for $172.61. It qualifies for Amazon Prime 2 day delivery and received an average of 4 out of 5 stars from 70 reviewers. 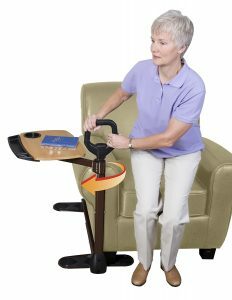 The Able Tray from Able Lift is a 360 degree rotating lift chair table that can be used with chairs, sofas, and recliners in addition to lift chairs. The tray features a handle, which can be use as support. 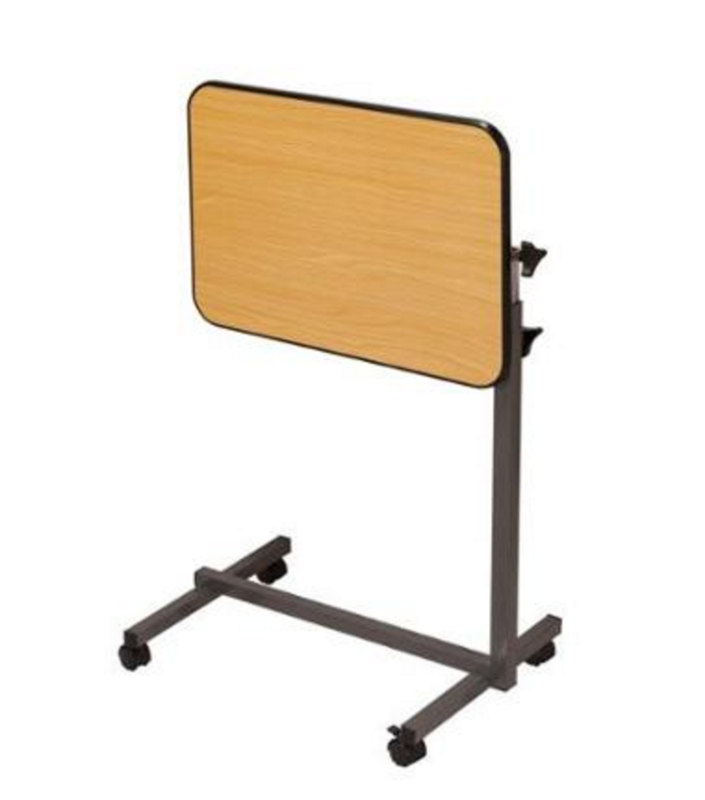 The tray also features an adjustable base. The base needs to be placed under the chair’s feet as the weight of the chair holds the table down. The base can be between 20″ to 36″, long enough for lift chairs. It allows the reviewer’s grandfather to get in and out of a chair easily. The table is sturdy enough to use a laptop on. It works very well with lift chairs. Click here to read reviews of the EasyComfort Rolling Tray Table. The Rolling Tray Table from EasyComforts is a wheeled table where one can push the table out to get up. It works for chairs, recliners, sofas, and beds. It is a popular furniture in retirement homes and hospitals. It is available for $47.99 on Amazon. It received 4 out of 5 stars from 46 reviewers. The table is 23.5″ x 16″ and has an adjustable height between 27.5″ to 47″. The table can be tilted. It will fit with any furniture that has a 3″ clearance. It works well for laptops, food, books, writing, and about anything else. 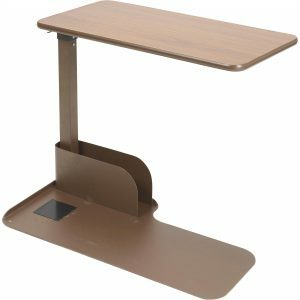 Drive Medical’s Seat Lift Chair Table – A so-so product. It does as advertise but, for it is available in either Left or Right configuration, if you want to move the lift chair later, you will be limited to where you can place it. At $172.61, it is expensive as well. We don’t recommend this table. Click here to buy this table. Able Life’s Able Tray – This is a versatile product! It can work on the left or right side of a chair. It swings 360 degrees, allowing for a wide range of movement. The handle gives extra assistance when sitting or standing — something the Drive Medical’s table does not do. We really like this table! At $153.12, the price is high but, given its functionality, it is well worth it. Click here to buy this table. EasyComforts’ Rolling Tray Table – A very good product at a right price! At $47.99, this versatile table is very affordable. As long as your lift chair has a 3″ clearance, this table will work for you. If you need support when getting up through, the Able Tray would suit you better. Click here to buy this table.